You are here: Home / Blog / Safe Salon / Do You Have Special Health Considerations? Do You Have Special Health Considerations? The CDC, World Health Organization and countless others exert a lot of effort estimating the impact of chronic illnesses on today’s world population. How do these issues affect YOU? One direct impact is the care of your feet. Routine Foot Care – is defined by Medicare as the activities of trimming of nails, thinning thickened nails, reducing excess calluses and application of moisture. This sounds just like a pedicure–minus the nail polish! Did you know there are nail technicians who are trained to safely perform the activities of Routine Foot Care (RFC)…and more! They are also trained to recognize any “not normal” conditions of your feet and lower legs and make appropriate referrals to physicians when needed. Who are these trained nail technicians? There are hundreds of nail technicians all across the U.S. and Canada who have taken advanced training in foot care. One such programs is the Advanced Nail Technician (ANT) certification program. Written by Janet McCormick in 2008, her program is now available through her online training program at www.nailcare-academy.com. Her students are very well trained in safe, aseptic cosmetic foot care. You just have to find them. How do I find these ANTs? One way, of course, is looking on this website, but in the event that trained technicians in your area have not yet registered their information, you can search for “advanced nail technician ANT” with your city name in your browser. Another way is to look for this logo displayed near their station. This logo is only permitted for nail technicians who have completed two certification programs: The Advanced Nail Technician (ANT) and the Safe Salon Concepts Certification Programs. A salon where all of the technicians are individually certified may also display this logo. This “gold star” salon will offer you safe, healthful cosmetic services. https://www.safesalon.org/wp-content/uploads/2016/03/canstockphoto12194614-1.jpg 533 800 masteradmin https://www.safesalon.org/wp-content/uploads/2016/04/safe-salon-png-100.png masteradmin2016-02-10 16:46:052018-05-31 04:16:42Do You Have Special Health Considerations? The Entire Salon is on Board! To Glove or Not to Glove? 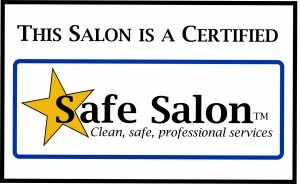 What is a Safe Salon®?